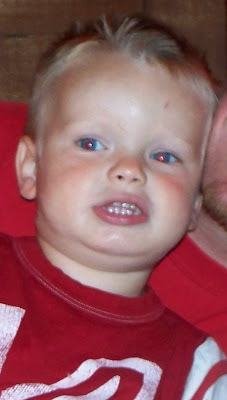 .....of my sweet boy Cameron with an entire mouth full of baby teeth. And, yes, he is only 2 years old. These were photos taken just last night, at the 4th of July fireworks. 1. 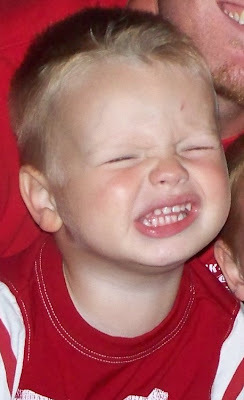 Cameron is, and will be until his permanent set grow in, missing his FRONT right tooth (as you look at him). Neither emergency rooms nor dentists, I found out today, will put a baby tooth back in. 2. Despite a large, gaping hole in his mouth, Cameron is OK. Grandparents and family, please don't worry--Cameron actually doesn't even seemed to be phased by all that has gone on today. He has some Tylenol floating through his system, and all he wants to know is, "When can I go back in the pool?" 3. I have never seen that much blood pouring out of someone in my entire life. 5. I thank God even more that the injury, though traumatic for us today, was not worse. I think about parents whose children lose eyes, or limbs, or worse, or children who suffer from life long illnesses or injuries, and I think to myself, "I sure am glad it was only a tooth that will grow back in a few years." 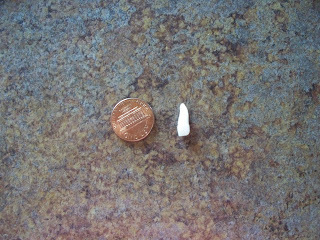 I'll try to post some pictures of Cameron's 'new' smile later, but for now, here is a pic of his tooth, root and all--that's a penny in the picture, for size comparison. Oh yes... we've done that. Glad he's okay. OHHH poor you! Seriously, I was cringing just reading what you wrote (not sure I want to know what happened as I tend to be horrible with these types of things) I am glad Shane was there for you - Gary handles the boys unexpected injuries SOO much better than I do (I say "unexpected" because I typically do okay with the fall down and skin my knee kind of stuff) Wow - I bet you were really shook up. Poor mommy and poor little guy. oh goodness dev! from now on I think all boys should play in bubble wrap pack n plays until they are at least 5 what do you think? uugghhh! poor cami!!! of all your children for this to happen to he was probably hysterical for a bit huh? poor guy! I know what you mean about having Daddy around to take control of traumatic situations! So glad everyone's okay, though. Oh NO!! Poor guy! I can relate to terrible accidents, blood pouring out, and seeing my little one hurt. Glad everything turned out OK, and that (while I'm guessing the pool had something to do with the accident) Cameron isn't afraid to go back in the pool!